Download an updated version of Books Online for Microsoft SQL Server 2005. Books Online is the primary documentation for SQL Server 2005. The April 2006 update to Books Online contains new material and fixes to documentation problems reported by customers after SQL Server 2005 was released. Refer to "New and Updated Books Online Topics" for a list of topics that are new or updated in this version. Topics with significant updates have a Change History table at the bottom of the topic that summarizes the changes. Beginning with the April 2006 update, SQL Server 2005 Books Online reflects product upgrades included in SQL Server 2005 Service Pack 1 (SP1). Microsoft Corp. today announced the availability of Microsoft® SQL Server™ 2005 Service Pack 1 (SP1), the product’s first major milestone since the launch of SQL Server 2005 only a few months ago. The release follows the remarkable reception, momentum and feedback offered by customers and partners in 92 countries. This has informed and accelerated Microsoft’s multiyear vision of Your Data, Any Place, Any Time. Microsoft SQL Server 2005 SP1 includes production-ready Database Mirroring functionality and the new SQL Server Management Studio Express, along with additional updates to SQL Server 2005 Express Edition targeted at users such as independent software vendors (ISVs) wanting to take advantage of greater functionality. SP1 also advances dynamic applications with the new SQL Server Management Studio Express, a simplified graphical management environment for SQL Server Express Edition. This tool builds on Microsoft’s commitment to extending the breadth of the SQL Server family to support all the data storage needs of Microsoft’s customers. It also complements the recently announced SQL Server Everywhere Edition, a lightweight and rich subset of capabilities found in other SQL Server editions, targeted for application embedded storage on clients. SQL Server Everywhere Edition is targeted to be available as a Community Technology Preview (CTP) this summer and released by year end. How did I miss this? 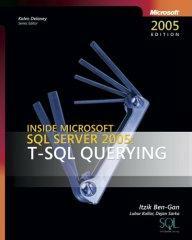 SQL Server MVP Itzik Ben-Gan has published his latest book: Inside Microsoft SQL Server 2005: T-SQL Querying. For all of you who read SQL Server magazine you probably know Itzik from his great SQL tips and puzzles articles. Take a detailed look at the internal architecture of T-SQL—and unveil the power of set-based querying—with comprehensive reference and advice from the experts. Database developers and administrators get best practices, sample databases, and code to master the intricacies of the programming language—solving complex problems with real-world solutions. You want to add a new user with read and write access and also the ability to execute all stored procedures but you don't want to make the user a db_owner. Of course you could use Red-Gate SQL Compare (I do) But let's say you don't have any of these tools and are using SQL Server 2005, what else can you do? 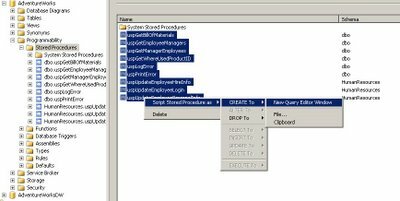 select ROUTINE_DEFINITION,SPECIFIC_NAME FROM INFORMATION_SCHEMA.ROUTINES to get the body of the stored procedure, the caveat is that this will only return 4000 characters. Am I the only one who thinks that the name "SQL Server Everywhere Edition" is very close to "Sybase SQL Anywhere"? I can see the jokes already "Not only does SQL server have the same codebase (not true) the name is also ripped off"
This is what Paul has to say about SQL Server Everywhere Edition "This new offering for storage on clients of all types will provide a lightweight, compact, but rich subset of the capabilities found in other SQL Server editions. Beyond having rich local data management capabilities, SQL Server Everywhere Edition will also include support for seamlessly synchronizing with other SQL Server editions and provides features that promote building rich client applications that operate effectively in today’s increasingly “occasionally connected” environment. SQL Server Everywhere Edition also shares a common programming model with the other SQL Server editions, enabling developers to transfer skills and knowledge quickly and easily. We expect to ship the first CTP of SQL Server Everywhere Edition this summer, with the goal of final release before the end of this calendar year." 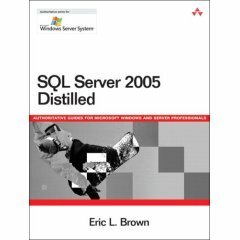 Addison Wesley Professional has published their latest SQL Server 2005 book "SQL Server 2005 Distilled"
Need to get your arms around Microsoft SQL Server 2005 fast, without getting buried in the details? Need to make fundamental decisions about deploying, using, or administering Microsoft’s latest enterprise database? Need to understand what’s new in SQL Server 2005, and how it fits with your existing IT and business infrastructure? SQL Server 2005 Distilled delivers the answers you need–quickly, clearly, and objectively.